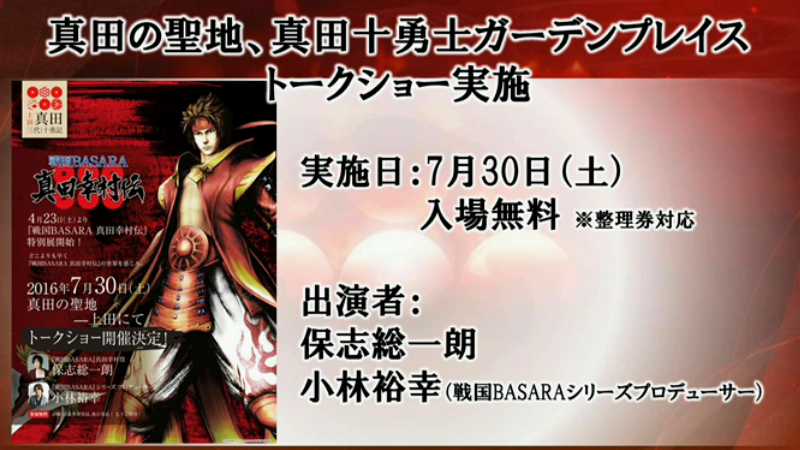 I was at work when the special hour-long Sengoku Basara: Sanada Yukimura-den broadcast aired earlier today, so I checked out the timeshifted version in the evening. 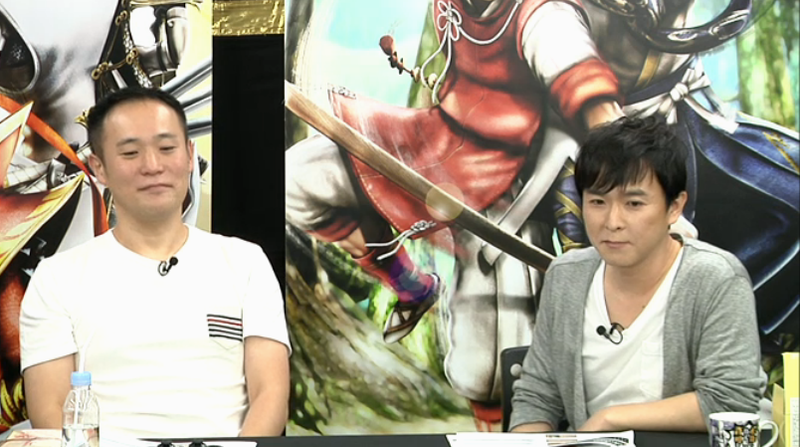 Host Saaya started the broadcast off by introducing series producer Kobayashi Hiroyuki (KobaP) and series director Yamamoto Makoto (YamamotoD). It's been a really long time since YamamotoD appeared to help promote the series! I've missed him. 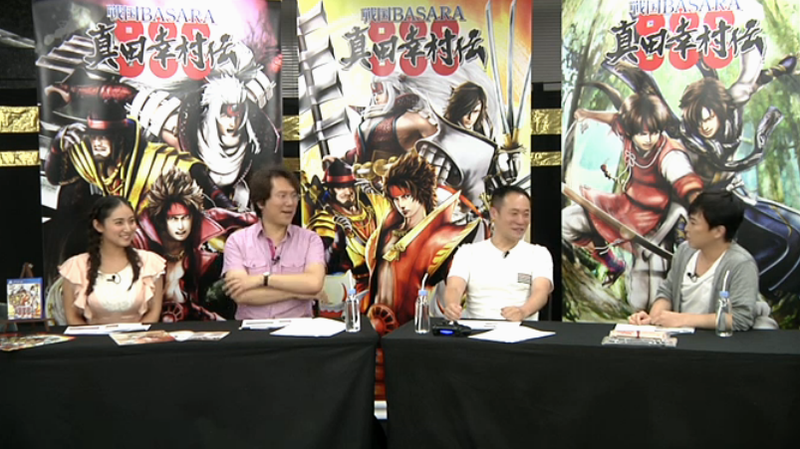 After the staff introductions, seiyuu Hoshi Souichirou (Sanada Yukimura) was welcomed into the studio. KobaP kicked things off by wishing the Sengoku Basara series a happy anniversary; the broadcast fell on the eleventh anniversary of the first game's release. 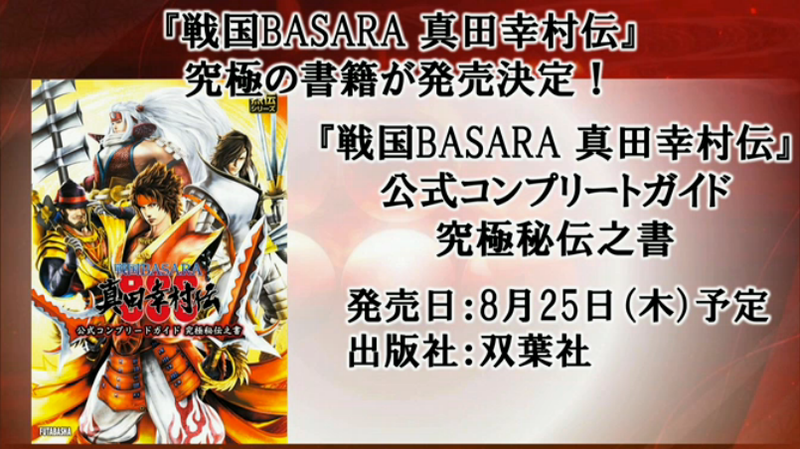 Don't miss the tribute illustrations from Sengoku Basara mangaka Itou Ryuu and Yoshihara Motoki. 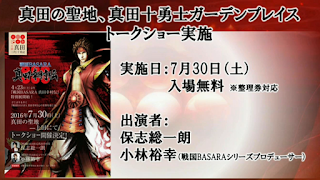 The first topic of conversation was the brand new promotional video which had been released for Sengoku Basara: Sanada Yukimura-den a few hours earlier. The video confirmed a bunch of small details about the game which I've added to my guide, but it also confirmed that there are two sets of Six Coin Challenges in each chapter heads: (red) and tails (gold). Here are the challenges from Chapter 5. 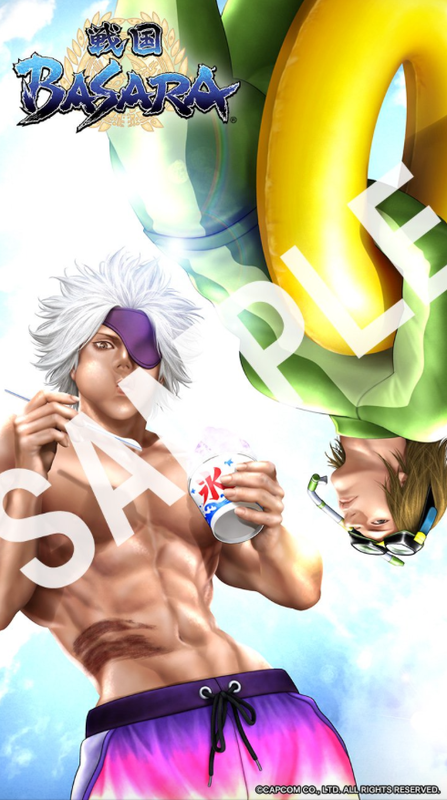 Furthermore, Personal Styles are teased for each character (including the non-story characters) and it looks as though the new versions of Yukimura and Masamune have separate Personal Styles to the old versions. KobaP then rapidly summarised the latest updates from Weekly Famitsu. In any case, they didn't waste any more time before launching straight into the first gameplay demonstration. 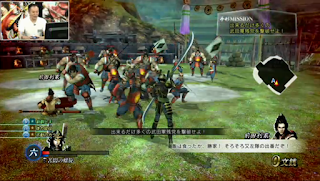 YamamotoD took control of Masayuki and Nobuyuki on The First Ueda Conflict: Tokugawa Invasion stage while KobaP explained what was going on. Hoshi chipped in with his own reactions periodically. The audio balance made it quite difficult to hear KobaP's commentary over the dialogue from the game, which is a shame as they were saying some interesting things in the background. The pop-up screen explains that the main objective is to defend the bridge system. There are four large contraptions which look like rollers, and enemy occupation chiefs will rush them. 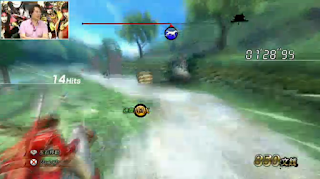 The vertical bar in the centre of the mini map represents the bridge system's current durability; if it runs out the bridges will fall and grant the invaders access to Ueda Castle. 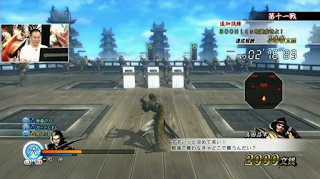 The chapter started off with a powerful cutscene with an aerial Ieyasu challenging the Sanada clan from a position high in the sky atop Tadakatsu. Masayuki and Nobuyuki defended for a while, then the action abruptly shifted to the other 'minigame' where Yukimura has to race towards the castle on horseback. I'm guessing this is the same way that Sasuke's stage will fit into the The Second Ueda Conflict: The Path To Sekigahara chapter later on; it will cut to show what Sasuke is up to then switch back to the main conflict. I'm going to have to figure out a good way to summarise the objectives in my guide. The controls are simple with X serving as the Jump button. You can see the little 'speed MAX' symbol in the middle of the screenshot (sorry about the quality). This appears when you gather the 'acceleration carrots'. I don't think the controls will present anyone with any problems even with a language barrier. 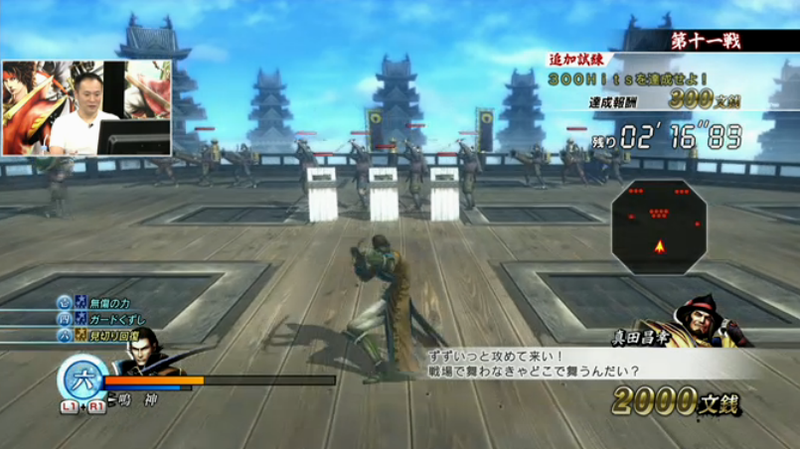 Once Yukimura reached his goal, the action switched back to the team of defenders at the castle. 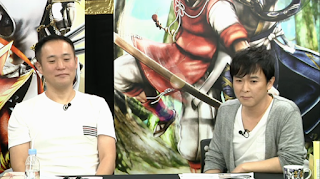 YamamotoD put both of the new characters through their paces well and made them look fun, especially Masayuki (who hadn't shown us so much of his gameplay to date). The reason he lost was that he had a strange combination of Bushin abilities equipped, presumably to make things more challenging and demonstrate some of the options the system offers. He did much better on the second attempt. It was weird seeing Katsuie all fired up and full of life in this story. I'm much more used to the miserable version. 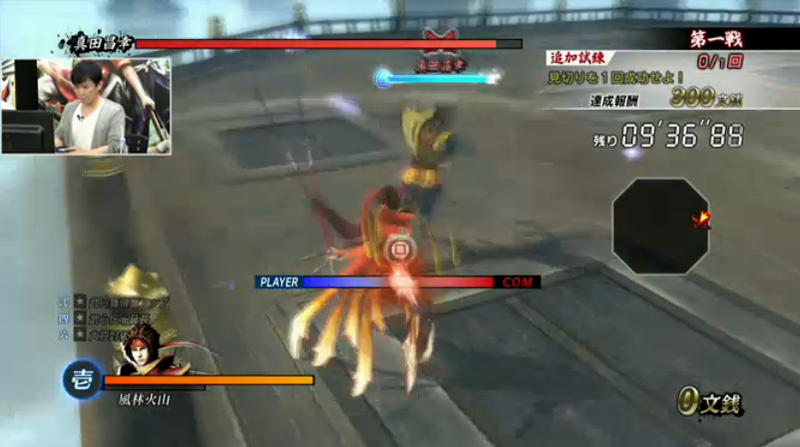 The next gameplay demonstration was Katakura Kojuurou in Sanada Trials mode. This gives me a good excuse for a gratuitous picture of Kojuurou. They let Saaya pick some slightly later stages for once instead of running through the first few. 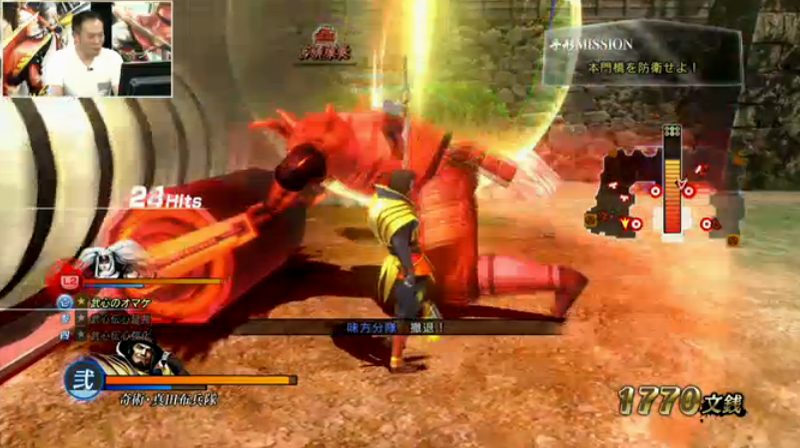 A team of Kanbee and Matabee took YamamotoD down on the thirteenth stage. 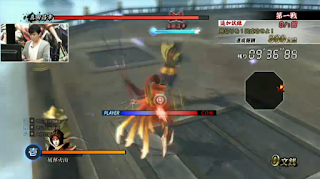 On his next attempt he got past the two 'bee's then lost to Yukimura a couple of stages later. The boss fights seem reasonably punishing and they will probably require players to master the Bushin system if they don't want a hard time. 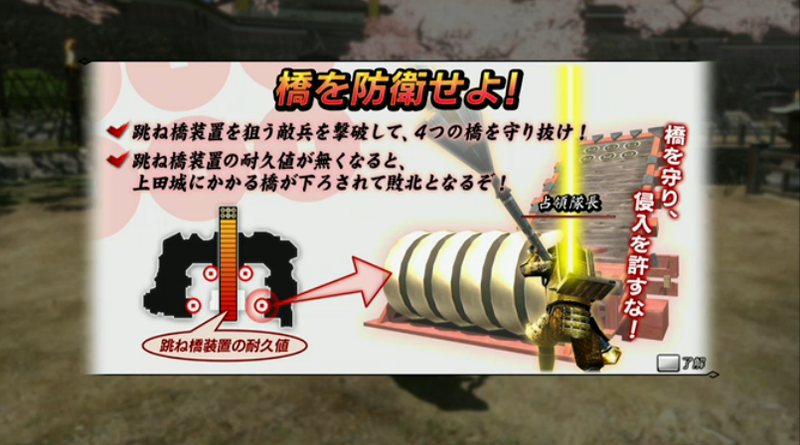 Here's the current list of Sanada Trial stage objectives from the various demonstrations we've seen so far. More than 30% done! If only all guides were this easy to write. 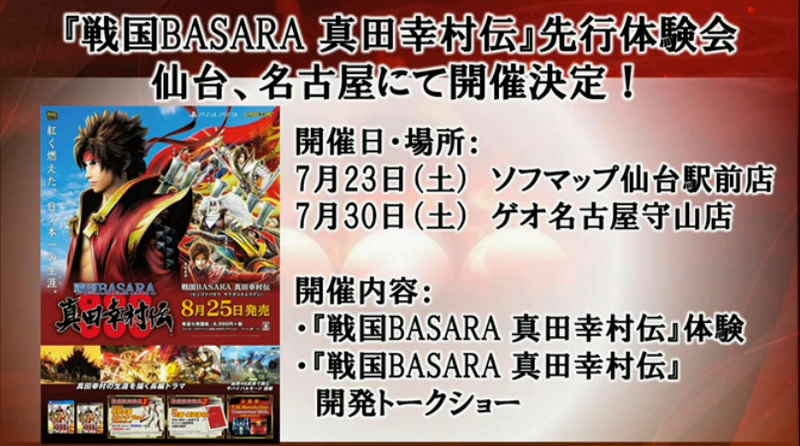 It was then time to run through a bunch of general Sengoku Basara news announcements, most of which I'd already covered in previous posts on this blog. The special Capcom TV LINE keywords are now being collected over at the official website here, so you can catch up on any smartphone wallpapers you missed that way. A new LINE picture was released for the broadcast, too; Itou Ryuu has drawn a very summery illustration of Chousokabe Motochika and Mouri Motonari. After this weekend's in-store preview event in the Sofmap store in central Sendai, there's going to be another on Saturday 30th July 2016 at a GEO store in Nagoya. The Sengoku Basara: Sanada Yukimura-den Official Complete Guide: Ultimate Tome Of Secrets will be released on 25th August 2016 via Futabasha. It will contain all of the usual spoilers and gameplay information for those who want to blow the game's secrets wide open right after it's released, along with the game's script, CG artwork and design illustrations. 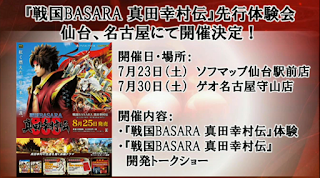 There was a reminder about the special free talk show with KobaP and Hoshi at the Sanada Juuyuushi Garden Place on 30th July 2016. The final segment was an interactive quiz for the viewers with prizes on the line. The questions were super-easy and referred back to gameplay terms which had already been mentioned during the show. I wish I could have participated; it's the main drawback of watching on a time delay! And that was all! I am adding the new gameplay information to my reference materials post as usual. Great update , ur effort is admirable , they need to bring back Yamamoto in every event cuz he actually knows how to do Sick combos as i heard . If Katsuie is "all fired up and full of life" in this game is gonna be rather weird to see. Well, good for him! More modes huh? Would be nice, but could be that Keiji also will get a side story mission. I'm a bit disappointed that it appears that the side character missions just take place in a small area vs a boss or enemies coming in. I thought they would at least be able to go through some part of the stages...so it's very story and dialogue focused then. 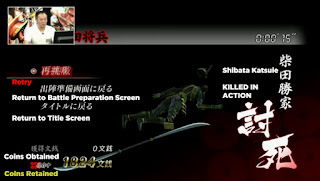 Curiously, "The truth about Battle of Tenmokuzan" with Akechi as playable character, is a more larger stage: you have to travel a little bit while protecting Nobunaga (that's weird). 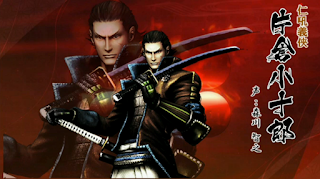 Since the moment I saw the video of "Battle of Tenmokuzan", I knew Katsuie personality would going to be different. Indeed, he's a little maniac XD XD XD But it has sense: probably at that point he didn't rebel against Nobunaga yet. I remember that in Sumeragi, before his attempt of betraying Nobunaga, Katsuie was more... "enthusiastic". That makes sense though, gotta protect that Nobunaga before Honnoji barbecue time. Good that there is a larger stage, perhaps that means other characters get a larger stage too. 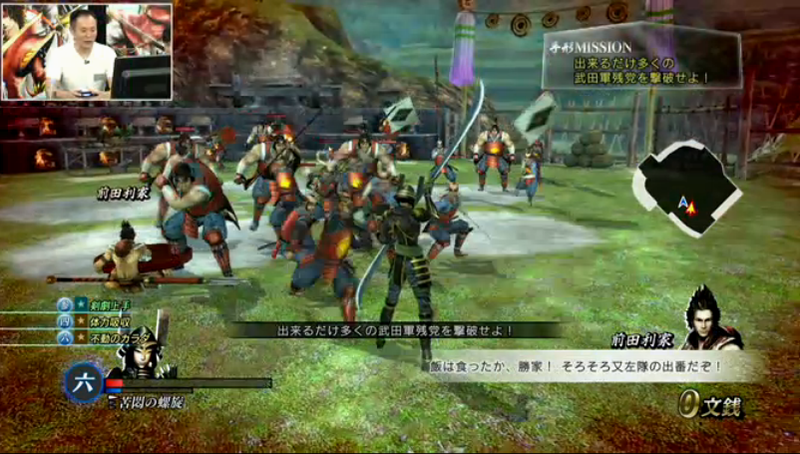 Definitely more fun to see maniac Katsuie than moping Katsuie!